Ok, first of all I know it’s not Friday, but regardless of that I still found this important enough to write about. Security- Firefox 3 includes phishing and malware protection, and a new feature instant site ID info. Customization- Like Firefox 2 Firefox 3 will have the same support of plug-ins and other add-ons. As of right now there are approximately 5000 or so add-ons. Other features- Such as, one-click bookmarking, “smart location bar” increased performance, built-in spell checking, session restore and a zoom feature. 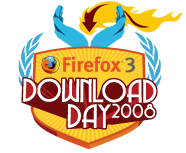 I am excited to see Mozilla come out with a new version of Firefox, and I know that I will be participating in “Download Day 2008”, but what do you think about all of this, or even about Firefox in general ? To learn more about “Download Day 2008” go to Mozilla Firefox’s website, or simply subscribe to my RSS feed to keep up on the latest announcements.